Here we go... I added a little decoration to the dresser in our dining room at the beginning of the week. I love adding in aqua with the traditional red, pink and white. I made this wool wreath (or yarn wreath as you see them called on Pinterest) for less than $15 - a polystyrene wreath ($5) from Ikes Emporium, three balls of wool ($2 each) from our local $2 Shop (with heaps left over), two sheets of felt ($1 each) from Spotlight, and 20cm of ribbon ($1 per metre) from Ikes Emporium. 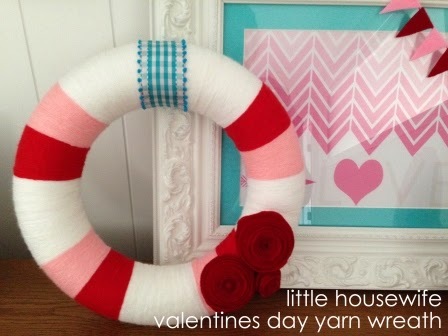 The framed artwork was a free valentine printable The Crafty Cupboard. 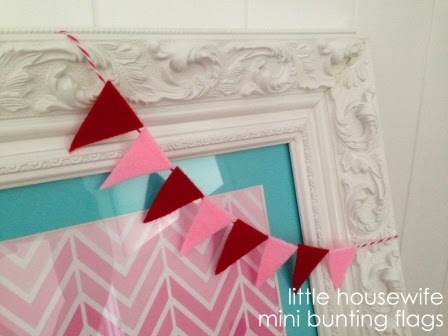 I made the mini bunting flags from some felt scraps and a small length of bakers twine. I sealed the back of each paper bag with some fabric tape that I won from Miss Molly Coddle. On Valentines Day morning the girls dressed in matching cupcake pillowcases dresses from Valentina's Place which I bought over a year ago. I traced some hearts using some cookie cutters, cut them out and blue tacked them to the wall for some photos. This is Maddie blowing some kisses. 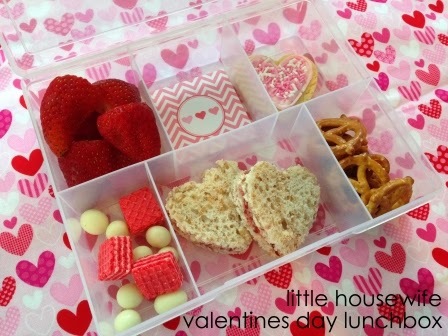 A tradition from previous years, I made Maddie a special little Valentines lunchbox for Kindy. 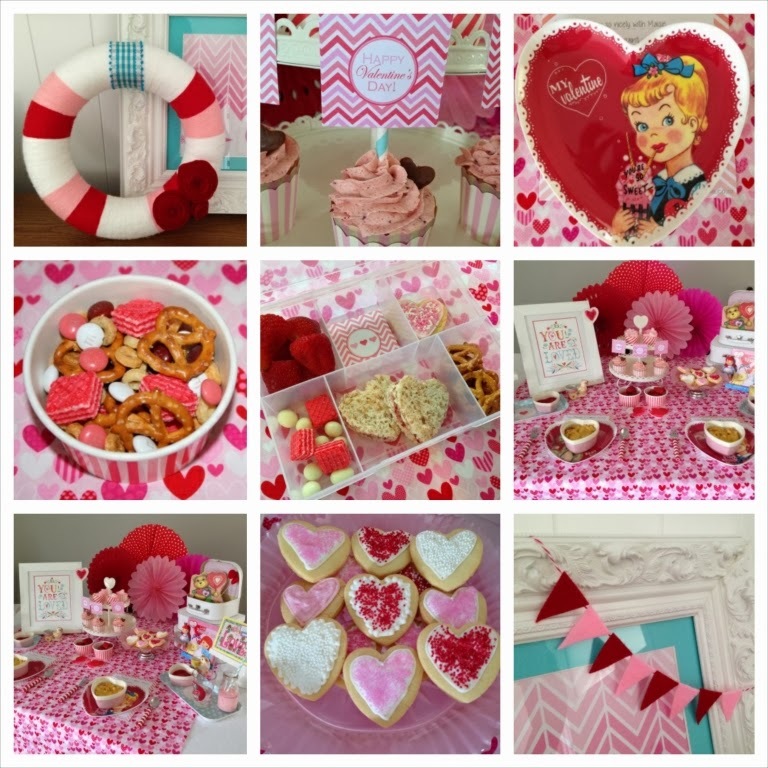 Heart shaped raspberry jam sandwiches, fresh strawberries, a heart shaped iced sugar cookie, pretzels, pink wafer biscuits and yoghurt raisins. A very special treat lunch! 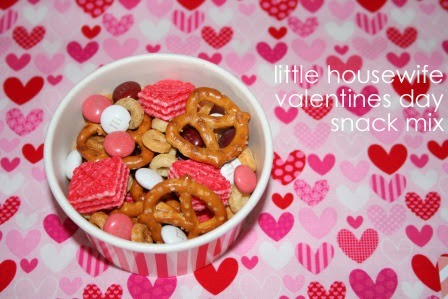 We don't usually have afternoon tea in our house (it seems to spoil dinner too much) but I made a special afternoon snack for today - pretzels, cherrios, mini wafer biscuits and new flavour raspberry M&Ms. This was Maisie's side of the table. The framed "You Are So Loved" sign is a print from Katie Daisy which normally hangs in Maddie's room. The little decoration hanging on the side of the frame is one of the salt dough hearts that Maddie made and painted. 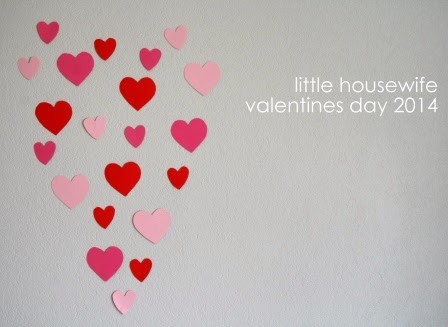 The "You're My Sweetheart" Valentines Card is from Lemon Tree Studio. The framed photo of my girls is from Typo. The vintage glass milk bottles (left over from Christmas) are from Sweet Pea Parties. The retro tumblers are from Pottery Barn Kids. 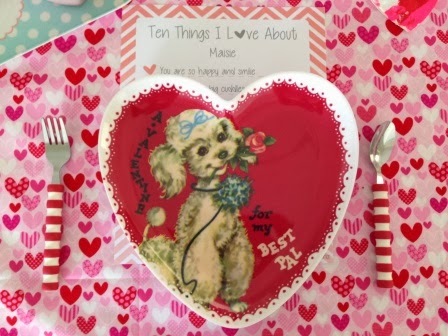 The heart shaped ceramic dishes were on special last year from Stevens. The pale blue melamine trays are from the clearance bins at The Warehouse. 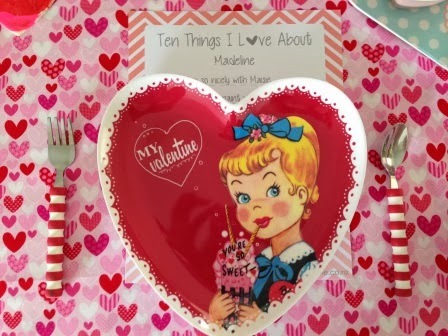 I bought the vintage Valentines plates years ago from Pottery Barn Kids. The red and white striped cutlery is a brand called Gripables from Kidz Space which we use every Christmas. I made the Ten Things I Love About You sign. You can download and print yours for free here. And this was Maddie's side of the table. The details are much the same as Maisie's side. 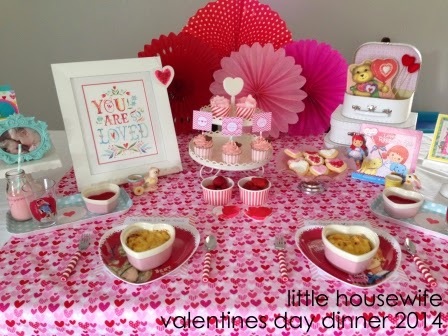 For dinner, I made the girls mini Macaroni Cheese with Cauliflower and Broccoli in little heart shaped dishes. I've been wanting to try out some freeze dried fruit powders for a while now (which is what I hear they use at Petal Cupcakes to achieve their amazing flavours). I tried the Fresh As Strawberry Powder and followed this cupcake recipe. My husband claimed them to be the best cupcakes I've ever made. That's a pretty big call! They weren't a patch on Petal Cupcakes as far as I was concerned but the fruit powder was delicious though. I used the fruit powder in both the cupcake batter and the icing. It gave them both a great colour and flavour. I iced some small heart shaped sugar cookies the night before - it was a terrible icing job so don't look too closely! 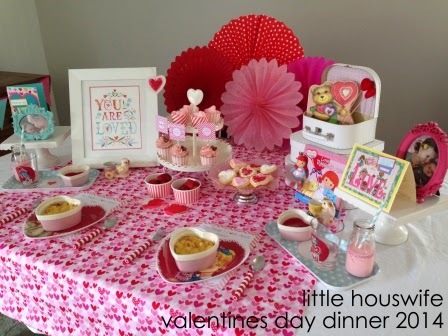 There were also some little baking cups of heart shaped marshmallows, raspberry jelly and fresh strawberries. We like to give the girls a couple of little Valentines Day gifts each year. I purchased these so sweet chair backers a few years ago from Miss Pretty Pretty and finally got to use them! They'll be great to use through out the year for special treats. The girls each got some new heart pyjamas and two Valentines themed books each. Maddie also got a Valentine Angelina Ballerina DVD and some Hello Kitty Jelly Bellys (big sister benefits!). I particularly love the "Love, Ruby Valentine" book that we gave Maddie. The story line is so gorgeous and the rhyming is so sweet!